Oct. 14, 2013. The third-annual Boone Heritage Festival was held on Saturday. From old-time music and storytelling to flintlock rifle marksmanship and much more, the festival, which is presented by the Town of Boone and the Southern Appalachian Historical Association, celebrated 18th-century Appalachian living on Saturday with the third-annual Boone Heritage Festival. Amidst a busy fall weekend with a full slate of activities for locals and visitors to the High Country to enjoy, many came out to the Daniel Boone Park to enjoy a walk back in time during a rain-free morning and afternoon. Many volunteers came out and exhibited the old ways through spinning and weaving wool to creating fine leatherwork. Mike Campbell, a frontiers-skill expert, (see image below) who showcased some of his handiwork, and a Travis Souther, a former resident who know resides in Greensboro and who spun and weaved wool the old-timey way, were among the volunteers who shared their knowledge with attendees to the Boone Heritage Festival. Also, Campbell and his son Cole were manning the popular tomahawk-throwing activity. “There was big group there at one point,” Ligon added. For more information about the Boone Heritage Festival, click here. 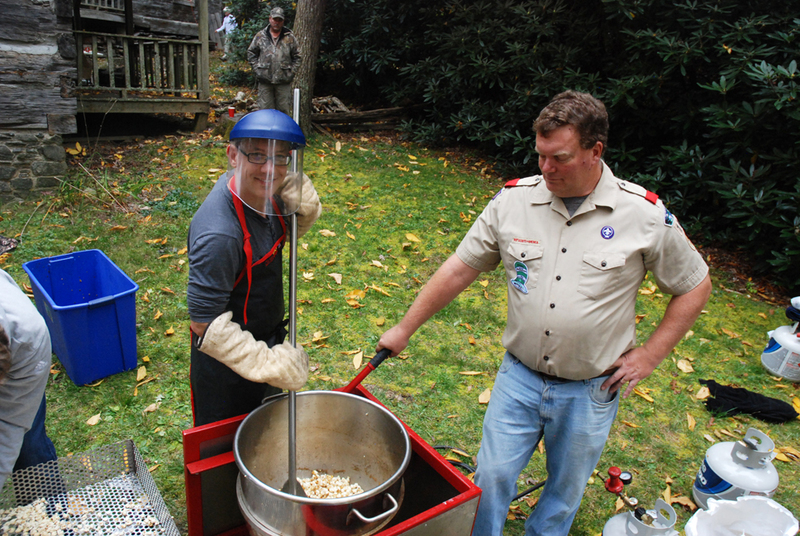 The Boy Scout troops make popcorn for hungry passersby. Boone Town Council Member Rennie Brantz is among those playing old-time music in the jamming area. The weather held up for a fun day of Appalachian heritage at the Daniel Boone Park. s A marksmen shows off his rifle. Another marksmen shows off his attire. Cooking the old-fashion way at the Boone Heritage Festival. Hatchet throwing was one of the skills demonstrated during the Boone Heritage Festival. Travis Souther spins and weaves wool.